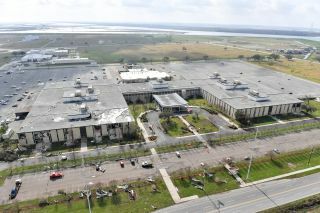 Tornado damage at NASA's Michoud Assembly Facility in New Orleans is clearly visible in this aerial view of the center. A tornado hit the NASA center on Feb. 7, 2017. NASA's Michoud Assembly Facility in New Orleans will remain closed through at least Sunday (Feb. 12) as recovery efforts continue after a powerful tornado struck the center this week, agency officials said. A tornado struck the Michoud Assembly Facility on Tuesday (Feb. 7), causing damage to the sprawling center where NASA once built massive stages of its Saturn V moon rocket and space shuttle fuel tanks. The core stage of NASA's new megarocket, the Space Launch System, will be manufactured at the assembly facility. You can see photos fo the tornado damage here. Of the Michoud facility's 3,500 employees, five were injured when the tornado struck. NASA recovery crews have been working to restore the center to operational status so employees and tenants using the center's facilities can resume work. "The teams on-site have made good progress in their continued damage assessments and restoration work. Visual damage assessment are ongoing," NASA officials wrote in a status update today (Feb. 9). "Power has been restored to key substations, the main NASA administration building, and the U.S. Coast Guard facilities with further progress is expected today."